7 Piece Middle Eastern Band – Based in Brisbane Australia. Available locally and internationally. Available for Arabian theme nights, Corporate events, Private parties and Weddings. Click here to listen to an mp3 sample 2.2 Mb. An exciting and colourful act, combining the evocative music of the Middle East and North Africa, with the beautiful art of Belly Dance. A unique ensemble,this talented group specializes in Classical and Folkloric belly dance music, from the complex orchestral pieces of Egyptian composers to the up-beat village songs of Egypt, Turkey and neighbouring regions. The authentic sounds of traditional instruments interweave with Tamara’s subtle yet passionate movements, creating performances that are both appealing to the ear and visually exciting. 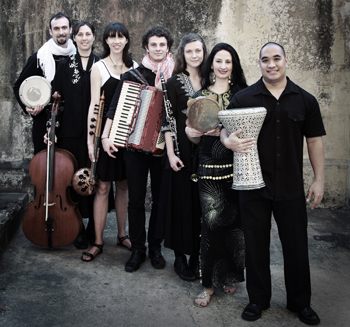 Their band can be seen at festivals, concerts and belly dance parties around Brisbane and Australia.